Aristotle held that philosophising begins with wonder. The African philosopher Jonathan Chimakonam suggested that, while wonder might have instigated Western philosophy, it was frustration that spurred African philosophy, with the emergence of radically Afrocentric nationalist philosophers such as Léopold Sédar Senghor, Aimé Césaire and Kwame Nkrumah who saw in philosophy an ideological weapon for attacking those who sought to denigrate and subjugate Africans culturally and politically. 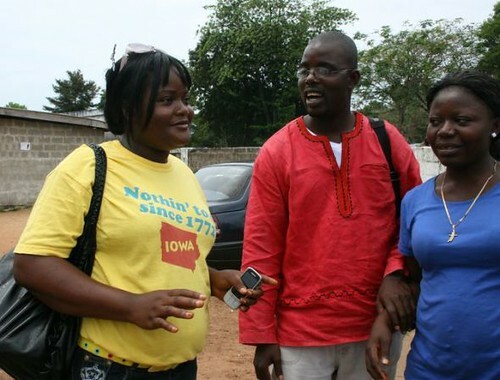 What is needed now is a 21st-century African synthesis that can help to resolve this struggle. ‘Consolation philosophy’ – spurred by both wonder and frustration – attempts to do just that. As we take our wisdom where we find it, we might recall that it was on this date in 1899 that the Boer regime in (what we now call) South Africa issued an ultimatum to the British government, declaring that a state of war would exist between Britain and the two Boer republics if the British did not remove their troops from along the border. The British had challenged the Dutch settlers for a variety of reasons, probably main among them for control of the gold deposits in the region. It was the largest gold-mining complex in the world at a time when the world’s monetary systems, preeminently the British, were increasingly dependent upon gold. The British ignored the ultimatum, and what we now call the Boer War (actually the second Boer War, as there has been an earlier skirmish) broke out. The two colonialists slugged it out until 1902, when the British took control. 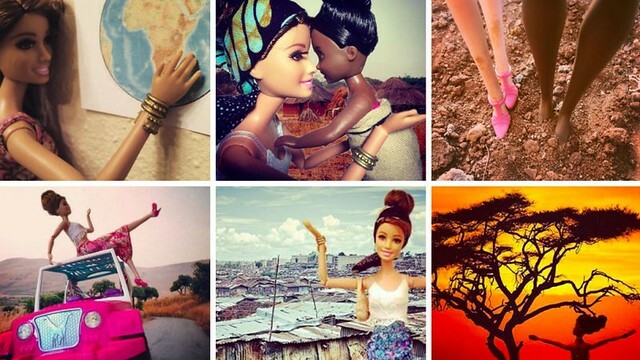 More at “Instagram’s White Savior Barbie neatly captures what’s wrong with “voluntourism” in Africa.” Pair with “The Smug Style in American Liberalism“– bracing stuff. As we rethink relief, we might send forbearing birthday wishes to Marcus Aurelius Antoninus Augustus; he was born on this date in 121. 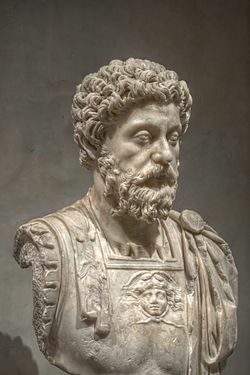 The last of the Five Good Emperors, Marcus Aurelius is also considered one of the most important Stoic philosophers; his Meditations, written on campaign before he became emperor, is still a central text on the philosophy of service and duty. What if the Black Plague had killed off almost all Europeans? Then the Reconquista never happens. Spain and Portugal don’t kickstart Europe’s colonization of other continents. 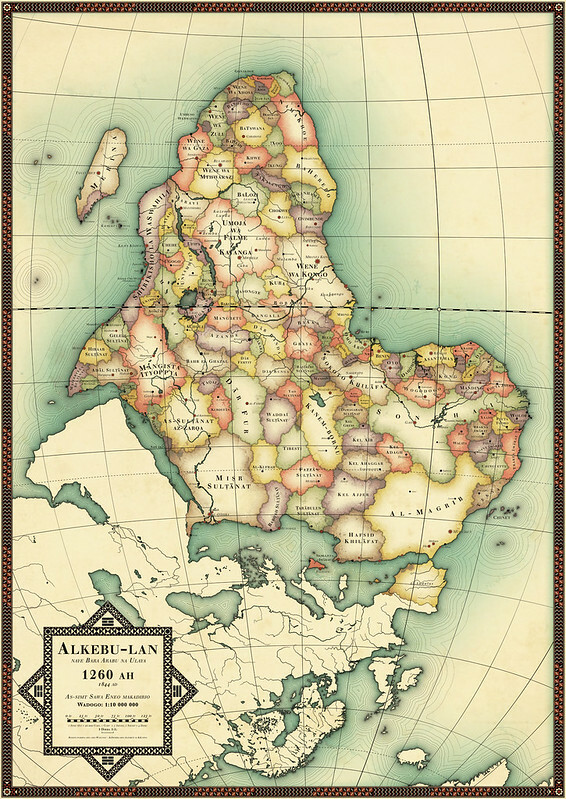 And this is what Africa might have looked like. As we explore, we might send an elegantly-filmed birthday greeting to Sidney Poitier; he was born on this date in 1927 (to Bahamian parents visiting Miami). An acclaimed actor, he became the first Bahamian and first African-American to win an Academy Award for Best Actor (in 1964, for his role in Lilies of the Field). Then in 1967, he starred in three successful films, To Sir, with Love, In the Heat of the Night, and Guess Who’s Coming to Dinner, making him the top box-office star of that year. 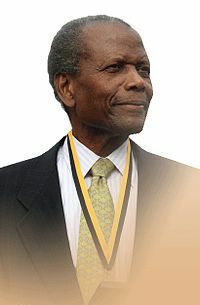 Poitier went on to direct a number of films, and in 2010 was awarded another Oscar, the Academy Honorary Award, in recognition of his “remarkable accomplishments as an artist and as a human being.” Poitier led a active life off-stage as well: he served as Bahamian ambassador to both Japan and UNESCO, and served as a director of the Walt Disney Company. He was knighted in 1974, and received the Presidential Medal of Freedom, America’s highest civilian honor, in 2009. 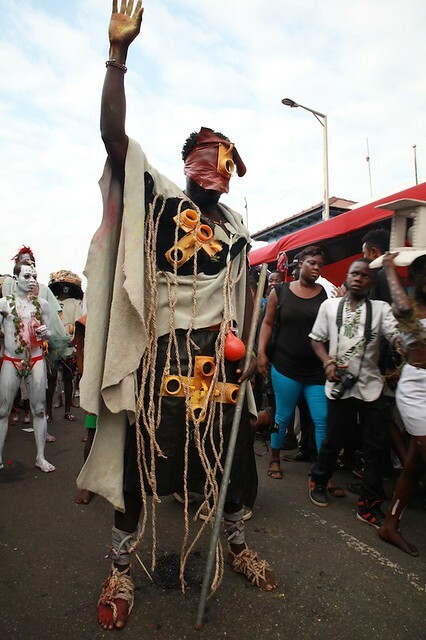 To the Western mind, “African Electronics,” the theme of this year’s annual Chale Wote street art festival in Ghana’s capital, might conjure up images of social media revolutions, telecommunications giants, farmers using smartphones, or other “tech solutions” to development. Not for artist Serge Attukwei Clottey. 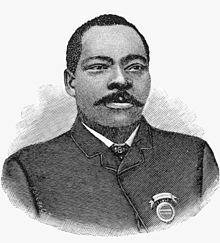 As we agree with Jaron Lanier that “You Are Not A Gadget,” we might recall that it was on this date in 1888 that Granville Tailer Woods– the first African-American electrical engineer working n the U.S. after the Civil War, whose many inventions (and 50 patents) earned him the moniker “the Black Edison”– patented the Multiplex Telegraph, a device that sent messages between train stations and moving trains, thus assuring a safer, better public transportation system. Palmyra, an ancient oasis city and one-time capital of a short-lived empire, has been razed before. In the third century, Roman emperor Aurelian punished its rebelling citizens by looting its treasures and burning its buildings. The city never recovered; its broken, but well preserved remains have stood in the Syrian desert ever since. Now looms the very real possibility of Islamic State (IS) finishing-off the job Aurelian began by reducing the historic site to rubble. Earlier this year, IS declared the three thousand-year-old palace at Nimrud, Iraq, a symbol of polytheism and demolished it with bulldozers and explosives. In the past days, Islamic State’s advance into Syria has brought Palmyra’s splendid ruins under its control. Its ancient temples, already damaged by fighting, risk suffering Nimrud’s fate. Conflict has often threatened antiquities, and violent threats to cultural sites often draw the public eye. Today however, development and resource extraction are far more common perils. Among UNESCO’s list of more than a thousand World Heritage Sites (places considered as of special cultural or physical significance), 46—Palmyra included—are categorized as ‘in danger’. Housing, mining, logging, and agriculture are responsible for putting more than half of the sites on the threat list. 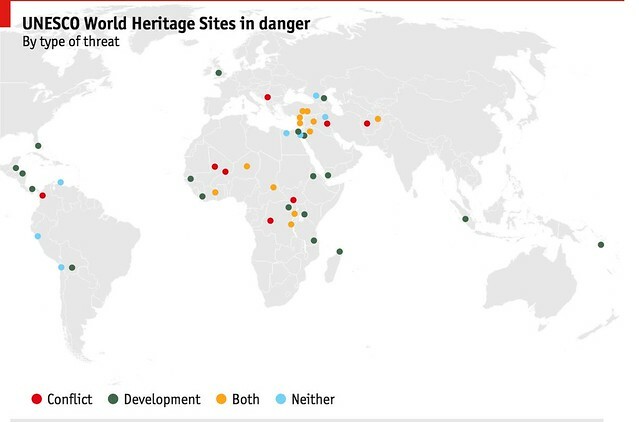 Via The Economist, where one will find an interactive version of this chart: mouse over a site to learn the details of both the treasure and the threat to it. As we promise to preserve, we might recall that it was on this date in 1415 that Infante Dom Henrique de Avis, Duke of Viseu, better known as Henry the Navigator, embarked on an expedition to Africa. 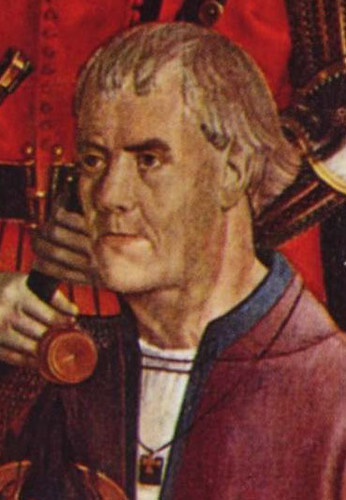 Having encouraged his father his father, King John I, to conquer a North African port, Henry went to assess the continent’s prospects for himself. 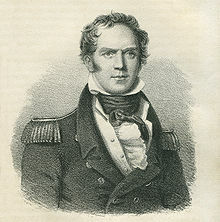 Impressed, he became the champion of Portuguese exploration and expansion, sponsoring the systematic mapping of West Africa, the development of new ships, and the continual search for new trade routes. If you’ve ever left a bag of clothes outside the Salvation Army or given to a local church drive, chances are that you’ve dressed an African. All over Africa, people are wearing what Americans once wore and no longer want. Visit the continent and you’ll find faded remnants of secondhand clothing in the strangest of places. 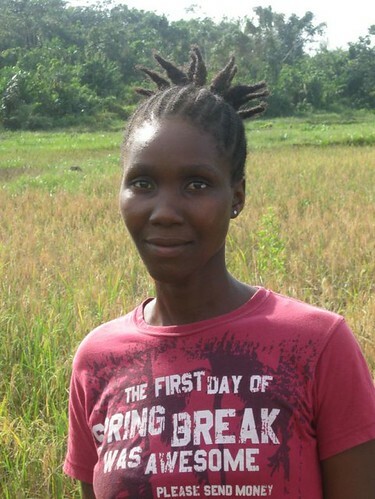 The ”Let’s Help Make Philadelphia the Fashion Capital of the World” T-shirt on a Malawian laborer. The white bathrobe on a Liberian rebel boy with his wig and automatic rifle. And the muddy orange sweatshirt on the skeleton of a small child, lying on its side in a Rwandan classroom that has become a genocide memorial. A long chain of charity and commerce binds the world’s richest and poorest people in accidental intimacy. 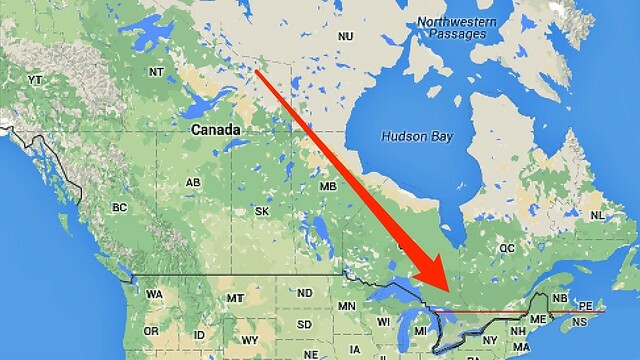 It’s a curious feature of the global age that hardly anyone on either end knows it. Mother Jones and the International Reporting Project collected a stunning gallery that helps those on this end of the chain better appreciate the other. 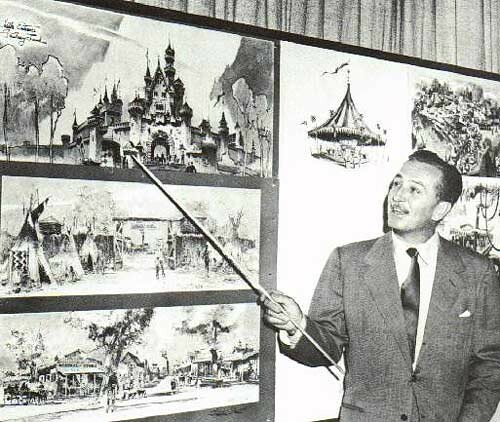 As we appreciate the long reach of the global market, we might recall that it was on this date in 1954 that Walt Disney announced plans for Disneyland in Anaheim, California. Construction was begun on July 21st of that year, and the park opened a year-and-a-day later.